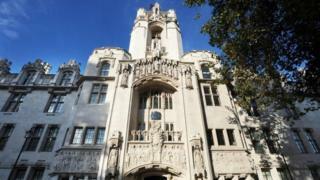 The government's system for deporting foreign criminals before they have had a chance to appeal breaches their human rights, the Supreme Court has ruled. In a landmark case concerning two foreign national criminals, the court ruled that having to appeal from abroad denied the men an effective appeal. Both men were convicted of drug offences and served prison sentences. The so-called "deport first, appeal later" policy was introduced as part of the Immigration Act 2014. Kevin Kiaire, from Kenya, and Courtney Byndloss, from Jamaica, had been granted indefinite leave to remain in the UK. Both have longstanding family ties in Britain. They received 24 months and three years in jail respectively after being convicted of unrelated drugs offences. In October 2014, the then-Home Secretary Theresa May made orders for their deportation to their home countries and rejected their claims that deportation would breach their right to a private and family life. Mrs May then said that the men's appeals could only be brought after they had returned to Kenya and Jamaica. Article 8 of the European Convention of Human Rights - the right to family and private life - requires that an appeal system against deportation has to be effective. The Supreme Court ruled that deporting the men before appeal breaches their human rights as it is likely to significantly weaken their case. The court ruled that the home secretary had failed to establish that the 'deport first, appeal later' rule struck a fair balance between the rights of the men and the interests of the community. As a result, the decision was unlawful. While there is little, if any, sympathy for convicted foreign criminals, the fact is that parliament has given them a right to appeal against their deportation. 'Deport first, appeal later' was introduced as part of the Immigration Act 2014 and the Conservatives pledged to extend it in their 2015 manifesto. It removes a foreign criminal's right to appeal in the UK unless they can show a 'real risk of serious irreversible harm' if they are deported to their country of origin. It was designed to reduce the number of offenders fighting deportation by using human rights grounds, especially the right to a private and family life. Today's ruling is a hammer blow to the Home Office. Appeals will have to be 'effective' and that will often mean that they have to be conducted with the appellant in the UK. 'Deport first, appeal later' is damaged. Since December, in what amounts to a 'remove first, appeal later' policy, the process for certifying removal before appeal has been extended to other cases such as those brought by people who are not convicted criminals, but have overstayed their leave to remain here. So today's decision is likely to have significant implications for both the deportation of foreign offenders and the removal of others who are in the UK unlawfully. The lead judgment given by Lord Wilson pointed out that between 28 July 2014 and 31 December 2016, the home secretary issued 1,175 certificates in relation to foreign criminals. By 31 December 2016, only 72 of them had filed notice of appeal from abroad. The court noted that a few of the appeals may yet have been ruled upon by 13 February 2017. But it noted that, as of that date, not one of the 72 appeals had succeeded.